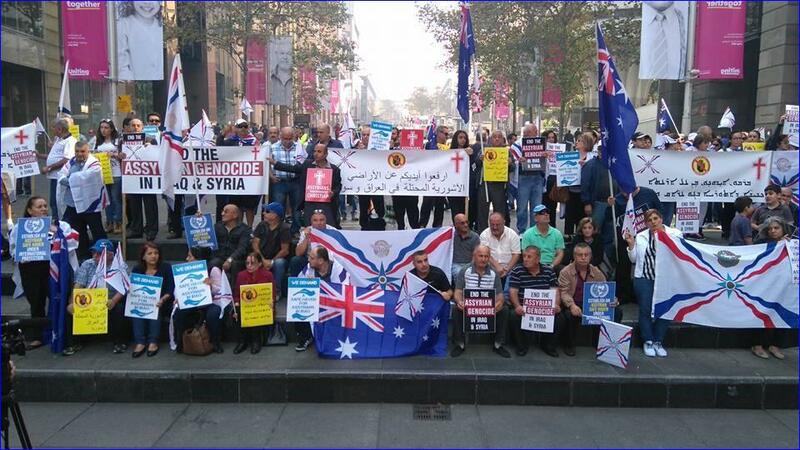 Sydney — Over 500 people descended on Martin Place in a public demonstration organised by the Assyrian Council of Australia. The demonstrators demanded an end to Kurdish aggression in the occupied Assyrian homeland as well as the brutal atrocities currently taking place against the Assyrian Christians in Iraq and Syria as a whole. The basis of the protest gave strong justification for the unremitting call for the establishment of an Assyrian safe haven under international protection. The protesters entreated the government and media to take immediate action to end the genocide of Assyrian Christians. With a united voice the people chanted slogans though the streets of Sydney city including “Hey hey, no no, Kurdish occupation has to go” “1234, Land grabbing no more, 5678 Assyrian lands we must liberate” and “Hands off Assyrian Land”. The demonstration was teeming with demonstrators flying Australian and Assyrian flags and carrying placards. Participants in the peaceful protest comprised mainly of the Assyrian Christian community from Sydney. They were joined by demonstrators from different backgrounds who stood in solidarity with Assyrians against the belligerent actions of the Kurdish Regional Government as well as the self-proclaimed Islamic State (ISIS). The protest was attended by Members of both State and Federal Parliament. The Parliamentarians delivered wholehearted speeches giving unconditional support to the establishment of an Assyrian homeland in Iraq as well as condemning Kurdish aggression. Speakers were: Mr Craig Kelly MP, Federal member for Hughes; The Hon David Clarke, MLC, Parliamentary Secretary for Justice; Mr Milan Maksimovic, the Christian Democratic Party candidate for McMahon who represented The Hon Reverend Fred Nile MLC; Dr Nicholas Al-Jeloo; Gilgamesh Dawood from Entity of Abnaa Al- Nahrain; Ms Ravina Joudo from the Assyrian Patriotic Party; and Ms Sana Gewargis from the Coordinating Body for Assyria World Conference . Mr Shahen also presented a letter on behalf of the Assyrian Council to Mr Craig Kelly MP requesting it to be hand delivered to the Hon Malcolm Turnbull MP, Prime Minister of Australia. The protest also included an Artistic Piece performed and recited by the 2016 Young Assyrian of the Year recipient Mr Ramos Jacob. The piece was based on the poem ‘Homeland’ by Naum Faiq who is duly considered one of the founding fathers of modern Assyrian nationalism. The Assyrian Council of Australia calls on all Assyrian organisations around the world to continue in their efforts to bring attention to the plight of Assyrians in Iraq and Syria and in particular their ancestral homeland of the Nineveh Plains and surrounds of Northern Iraq. This entry was posted in Featured News, News and tagged Assyrian Christians, Assyrian International News Agency, Australia, Mr Shahen, Northern Iraq by Orthodoxy Cognate PAGE. Bookmark the permalink.